Since last week, when the IDF began firing shells from the air, the sea and land at areas in north Gaza, there has been a 10 percent increase in the number of Qassam rockets fired from the Gaza Strip, Ynet has learned. On Thursday morning two Qassams were fired at Kibbutz Zikim, after 8 rockets were fired at Israel on Wednesday. Later Thursday, the shrapnel of a shell fired by the IDF toward the Gaza Strip hit a home in the southern community of Nativ Haasara, causing damage to the roof. There were no reports of injuries. Earlier, local residents complained that they were bothered by the shell fire as much as by the firing of Qassam rockets and asked the IDF to deal with the matter. The IDF explained that the wintry conditions disrupted its operation against Qassam cells, but vowed to keep up the pressure. The al-Aqsa Martyrs’ Brigades, which has been responsible for the most Qassam attacks, remains undeterred. On average, 20 to 25 rockets are fired every week, but 40 rockets have been fired since Sunday. Most rockets fall in open fields, in the sea or in the Gaza Strip. No one was injured and no damage was caused in the attacks, although a number of bystanders were treated for shock. All this happened in the midst of Operation “Southern Arrow,” during which the Israel Air Force launched raids at access roads, buildings and fields used by Qassam cells. On Tuesday, Palestinian civilians were injured when the IDF fired shells at Qassam cells operating near residential areas. The issue of Qassam fire was raised during a meeting of top security officials who updated Defense Minister Shaul Mofaz with the progress of the operation. 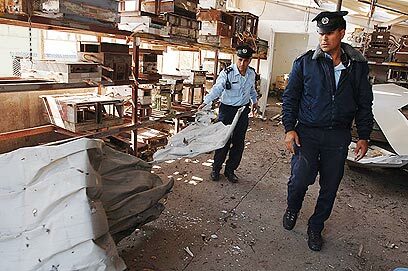 Security officials said there has been a rise in Qassam attacks in 2006. Officials also said terror groups are ever more motivated to dispatch suicide bombers to Israel and shoot at Israeli cars traveling in the West Bank. Officials linked the rise to unprecedented sums of money transferred from Lebanon, Syria and Iran to Palestinian terror groups. “We have to make the utmost effort to allow the citizens of Israel to celebrate Passover,” Mofaz said during the meeting. Mofaz ordered the IDF to cooperate with Israel Police to arrest illegal Palestinian aliens and send them back to the West Bank as they constitute a security threat. “When we launched this operation, which is medium in scale, I was clear that we will not have a decrease in Qassam fire in the short term. To reach a decrease in the number of Qassams fired at Israel we need patience, to give those on the other side time to internalize what they will loose if the firing continues,” a security official said. The operation is aimed at applying as much pressure as possible on terror groups to deter them from firing Qassams. “I am not sure the hastened fire is a result of the military operation, but they are certainly motivated. Following the IDF’s withdrawal from Gaza 82 terrorists were killed, some belonging to Qassam cells. If they continue this way, the number will only increase. We will respond to every attack and no doubt they will pay the price,” the official said. On the opposite side, no is getting overly excited over the IDF threats. Abu Ahmad, a commander at al-Aqsa Martyrs' Brigades, the armed wing of the Fatah movement in the north of the Gaza Strip, told Ynet that ever since the beginning of the intifada and the beginning of the launching of the rockets onto Israel, the IDF had tried to stop the Qassams using dozens of methods. According to Abu Ahmad the IDF has failed. "There is no chance that they could stop the attacks. We open fire from anywhere, at any time we choose, out of houses, groves, vehicles. The IDF cannot control the entire area at any given time. Instead of trying to stop the attacks, the Israelis should stop the escalation and only then we will stop the firing," he added. Abu Ahmad said that the more fire the IDF uses, the more his people are motivated. "The IDF sells lies to the Israeli people. There is no chance that the resistance will stop or the rocket launching will stop. The only changes we're considering regarding the Qassam launchings relate to their precision and distance. The rockets caused the disengagement and no one will stop them." Sderot Mayor Eli Moyal has warned in the past that the Qassam attacks will increase following the elections, and as far as he is concerned – the prophesy was fulfilled. "All the shells that the IDF is firing are just a waste. We think that a ground operation is inevitable and the IDF thinks so as well. The Palestinians escalate the attacks mainly to target the power plant and other strategic installations. We must simply kill anyone who is shooting at us. " For many residents of Nativ Ha'asara the past week was especially difficult. "Other than the Qassams attacks, the IDF shelling was more annoying. Last Saturday was really insane. The IDF must have fired at least 200 shells causing the children and the residents here to panic. We wanted the IDF to cease its fire because the shells were more nerve-racking than the Qassam attacks,” a resident said. The IDF is expected to set up an extra missiles battery near the Gaza Strip, in an effort to quell the fire of Qassam rockets from the tiny coastal territory. The army so far fired artillery rounds at Qassam launch pads using one battery. See all talkbacks "Qassam attacks up despite IDF efforts"